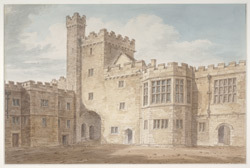 The Vernon family acquired the land around Haddon Hall in 1170 from the descendants of William Peveril, illegitimate son of William the Conqueror. Located in the Derbyshire Peak District, on the banks of the River Wye, the Hall originally consisted of an embattled tower surrounded by a high defensive wall. Defence was an important factor in the Middle Ages due to the almost constant feuding between local landowners who needed to protect their territory for their own kinsman and for whichever wider political "clan" they were in allegiance to. Over the centuries, the Hall evolved from fortified manor house to opulent family residence. When Buckler made this watercolour, the house had been empty for over a century. The Hall required extensive modernisation and the expense proved too prohibitive for the Rutland family who had acquired the estate through marriage in 1567. It was not until the 1920s, when the ninth Duke of Rutland wished to return with his family to Haddon, that the house was restored to its original splendour.